The Fujifilm Digital Q1, before operation. I opened more layers until I reached the back, where the LCD screen was, and the final screws which held the infrared cut filter in place. From the front. Note the black thing in the middle; that holds the infrared cut filter. I tried to push out the infrared cut filter. 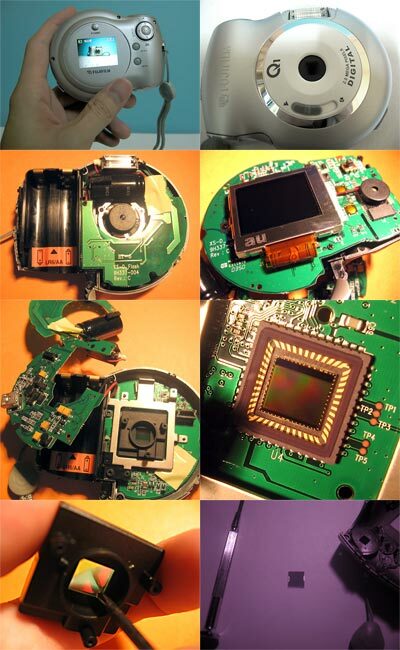 A handy Philips screwdriver, the infrared cut filter and the back plate, in infrared. Left: Two negatives in front of the lens to block out normal light, and a few layers of negatives on the flash; right: opened, for ‘mixed mode‘ where it gets infrared and normal light. My first expression when I assembled it back, and it worked! It could see infrared light. Okay, this picture was from before; the camera could never focus properly, being a fixed focus camera with a macro range of 60-120cm. The ‘mixed mode‘ lets in natural colors and a good dose of infrared. Infrared only, but because I removed the infrared cut filter, the camera became shortsighted! …which wasn’t true. Plus my camera couldn’t focus that far, so yeah, it would take very specific lighting and heat conditions to do what he said infrared photography could do. This entry was posted in Geek, Pictures on April 26, 2006 by 2konbla. the inside man/woman has left the building. anyway, can this be done with those camera with optical zoom (lens that will protrude out) ? Serge: Yeah it can be done on any digital camera. (Analog film cannot pick up infrared at all.) I think a camera with manual focus setting will be better because the camera might not be able to autofocus. Most cameras, when zoomed, MAY have a white spot in the center due to internal reflection in the lens. Actually IR photography can penitrate only ONE layer of thin clothing. I R impressed that you came up with that gimmick, Alb. ok, i’ll go home now and toy with my camera, if my mum catches me, i’ll say it’s Albert who taught me. lol.